Esteem - Hanoverian mare - Legacy Farm Ltd.Legacy Farm Ltd. 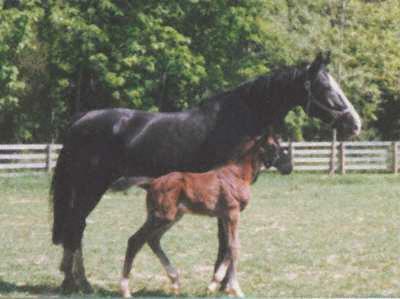 This mare’s pedigree contains three famous Hanoverian stallions, Ferdinand, Duellant, and Senator. Denar was a three quarter brother to the German Champion Diplomat. She has an uphill confirmation and very nice gaits. We do not know much about her show background. She is sensitive and skittish. Her offspring have good confirmation, gaits, and a good calm temperament. Her latest offspring, Achim and Angel, have good confirmation, temperament, and above average athleticism. In 2003 we donated this mare to Virginia Tech’s Equestrian program.